A suspect leading police on a chase going eastbound on the westbound 10 Freeway crashed into a California Highway Patrol cruiser, causing a traffic jam on Wednesday, Feb. 1, 2017. 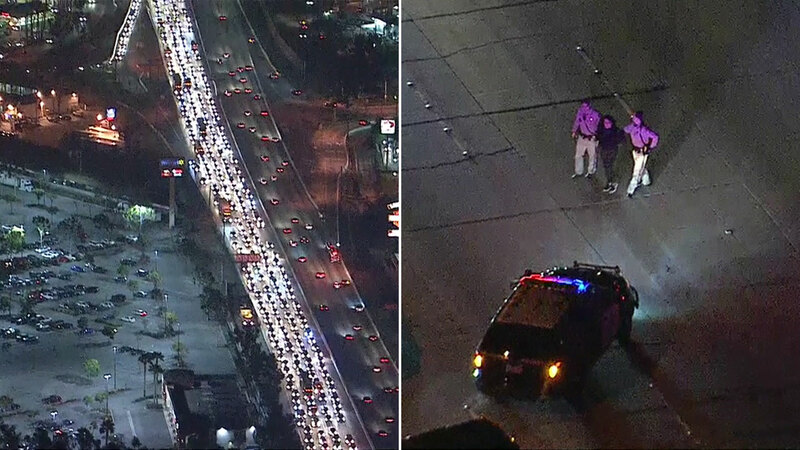 BALDWIN PARK, Calif. (KABC) -- A suspect in a high-speed chase drove the wrong way on the 10 Freeway before smashing into a CHP cruiser, police said. The suspect tried to flee on foot across the freeway, but was taken into custody. The CHP officer involved in the crash was believed to have only suffered minor injuries. The westbound side of the 10 freeway in the Baldwin Park area was shut down as emergency crews responded to the scene. The freeway was reopened by around 9:35 p.m. but the Francisquito onramp remained closed. The chase began in the El Monte area and the suspect - believed to be in a stolen car - drove the wrong way on the westbound side of the freeway, officers said.